The utility company just finished cutting down dozens of our trees. The trees, mostly slash pines and oaks, had grown tall enough to interfere with overhead power lines. The power company removed them to prevent damage to wires in future storms. Even though two crews of tree trimmers cut down almost a hundred trees, I had no problem with the project. I didn't object to their presence other than insisting that the workers, most of whom were smokers, not drop cigarette butts while they were on our property. More surprisingly, I wasn't sad to see so many trees felled. I wasn't always so unemotional on the subject of trees. When we moved to our property in 1992, trees were a rarity. On the entire 50 acres, there were only two huge oaks, four broad pines and a small stand of slender willows. The land was open, exposed and raw. Although the property was beautiful in its emptiness, our vision was to create a forest, to return the land to the woodland that longtime residents told us it used to be. During those early years, we attempted to reforest the land ourselves. Our first effort was to hand-plant 4,000 pine trees — back-breaking work that turned out to be a waste of energy. The 6- to 8-inch saplings needed a better start than could be provided by a bunch of amateurs armed with nothing more than a spade, a shovel, a desire to save money and a willingness to work. We realized our mistake as we sadly watched most of the green sprouts shrivel up and turn brown. Determined not to make the same mistake twice, we hired a professional tree planter. Driving in straight rows across the open land with a machine designed for the task, the tree man managed to install 11,000 pines in less time than it had taken my husband and I and our children to plant the previous 4,000. More important, unlike us, he knew what he was doing. The majority of his saplings lived, growing over the course of 18 years into the forest we envisioned. I've spent many hours observing my surroundings, focusing much of my attention on the growth patterns of trees. I learned that willows are not to be depended upon. Strong winds repeatedly broke willow branches and bent and uprooted their trunks. Maple trees can withstand weeks of wet feet, but pines planted too close to the lake have died when they've stood too long in water that has risen to abnormally high levels. I've come to realize how much hardier slash pines are than sand pines, and that all pine trees have roots that are easy to trip over because they grow so close to the surface. I've come to appreciate the inadvertent efforts of wildlife in helping me reforest. I've watched chokecherries and wild persimmon trees appear out of nowhere, the result of seeds dropped by birds and scattered by wildlife. Pine cones are another source of volunteer plants. The seeds of future conifers are nestled within the sappy confines of these brown containers, waiting until conditions are right for them to break forth and take root. And then there are bamboos. If we knew as much in 1992 as we do now about these beautiful, fast-growing, low-maintenance giant grasses, I doubt we would have planted as many pines. One of the main things I've learned from observing my surroundings is how quickly the landscape can change. In the beginning, when trees were scarce, the thought of cutting down even one sapling was unimaginable. Now, a tree-cutting crew can spend 10 days on the property slicing down one 35-foot tall leaf-bearer after another, and I hardly blink an eye. Time has buffered my emotions. I've gained patience and faith in nature itself to do what it does best — reproduce, grow and reseed the land. 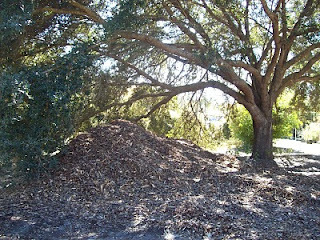 It also helps that we insisted the power company leave all the wood chips left over from its tree-clearing operation. We may have lost close to 100 trees, but we gained a lot of compost, and it's out of that compost that new trees will grow.